Until the beginning of last summer I had wakeskated only a handful of times, and only one of those times being on a "real" wakeskate. The rest of the time I was on an old blank Nectar. Last summer I grabbed a real skate, got into it more and more, and eventually ended up really falling in love with it. In fact, I wakeskate so much now that wakeboarding has become a very rare occurrence for me. Rather than continue to wear out my old Vans in the water, I decided to get a pair of wakeskate specific shoes. I have a pair of Reef’s Slap sandals that have been holding up well for almost three years now, so I’m familiar with the quality of Reef products. Keeping this in mind, and the fact that I’ve been a Byerly fan (or pro ho, as the kids like to say) since day one, I decided to go with the Byerly wakeskate shoe. The main features of the shoe are its CMEVA sole, mesh construction, and high abrasion toecap. Some nice subtle features are drainage holes in the sole and aluminum tipped laces. The shoes also have flotation in the tongue which Reef touts as a main feature. This is somewhat redundant when considering the soles float the shoes anyway. The Byerlys originally came in three colors: black, navy/gum, and white/blue. With the popularity of the shoe, this year Reef added grey to further cater to varying styles. Overall, the shoes are quite functional. They stick well to both forms of grip (tape or foam), drain very well, and they aren’t weighed down heavily. The shoes also dry relatively quickly, but it’s nothing that would make Marty McFly jealous. 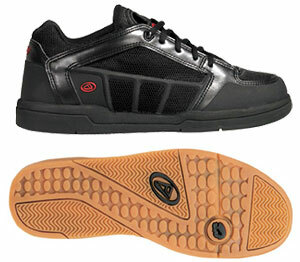 Some people wear the Byerlys only for wakeskating, but they are comfortable and suitable for everyday use. Although, their functionality for wakeskating comes as a detriment in the winter months. Their construction makes them light and airy, resulting in a shoe that won’t keep your feet warm when it’s cold out. Overall, I’m pretty happy with the Byerlys. They’re comfy, functional, and oh-so-stylish. And that’s very important because back in the day I read in some magazine that "you gotta look good to board good".